On Friday, NHL legend Gordie Howe (aka “Mr. Hockey”) died in his son’s home in Ohio. He was 88. His death came just one day before the classic, 1986 comedy Ferris Bueller’s Day Off was set to celebrate its 30th anniversary. 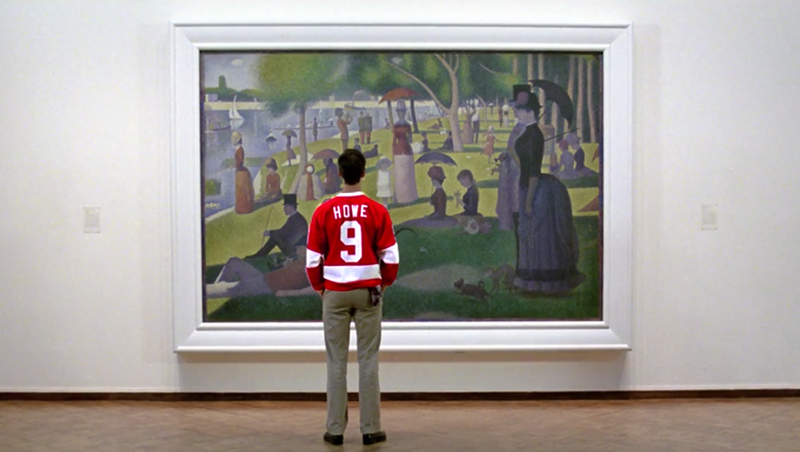 Many noticed the timing was strange, as Howe features prominently in Ferris Bueller’s Day Off. He’s not in the film, per se, but Cameron Frye, Ferris’s best friend in the movie, wears a No. 9 Howe Red Wings jersey for almost the entire film. The coincidence was unfortunate, but it piqued interest in one of the film’s lasting mysteries: Why the hell is Cameron a Red Wings fan, anyway? Cameron’s Red Wings sweater would seem a minor detail were the film not set in Chicago, a famously sports-obsessed city that doesn’t take kindly to opposing fans. Cameron is from the Chicago suburbs, so logic would dictate that he be a fan of the hometown Blackhawks. Instead he supports the Detroit Red Wings, the Blackhawks’ arch rival. It’s impossible that the filmmakers did this by mistake. John Hughes, the film’s writer and director, was a Chicago obsessive. He grew up in Northbrook, a suburb of Chicago, and remained loyal to the city throughout his filmmaking career. All of Hughes’s most memorable films — Sixteen Candles, The Breakfast Club, Uncle Buck, Home Alone — are set in the greater Chicagoland area and depict the city with a striking verisimilitude. Cameron’s Red Wing jersey is incongruous, but it’s incongruous on purpose. “Since I didn’t grow up in Chicago, I never gave it a thought,” Alan Ruck, the actor who plays Cameron, tells MEL. The Red Wings jersey was part of a convoluted backstory that was never revealed to viewers, he says. The revelation provides further insight into Cameron’s relationship with his father, whom he obviously despises. Assuming that Cameron’s dad is a Blackhawks fan, Cameron’s rooting for the Red Wings is an open act of rebellion against the old man. It also rules out the theory that Cameron has recently moved to Chicago from Detroit and is just clinging to his sports roots. “The psychology was that it was something that made Cameron feel good about himself, even though he was a Chicago kid,” Ruck says. The jersey is something of a security blanket for Cameron, then. This explains why Cameron chooses a Howe jersey, as opposed to that of some other Red Wings player. Howe was renowned for his toughness, playing in the NHL until he was a 52-year-old grandfather, and Cameron shields himself with that persona. But the jersey is also a way for Cameron to assert his individuality, much like the winter cap Holden Caulfield wears in The Catcher in the Rye.